Green Mountain is the fifth college in the nation and the second in Vermont to commit to fossil fuel divestment. Kudos to Green Mountain College for its announcement this week that it is committing to divest its $3.1 million endowment from companies profiting from fossil fuels. 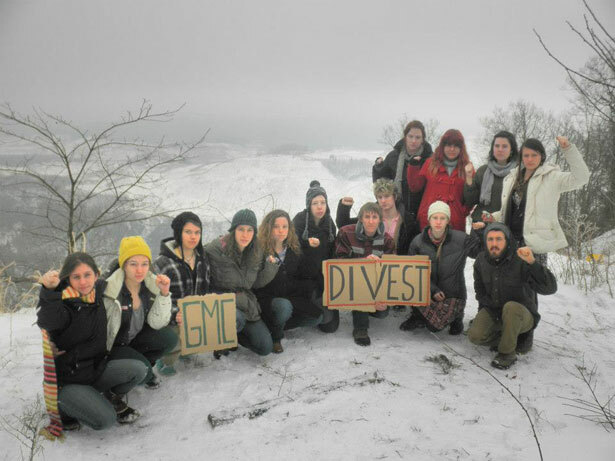 GMC is the fifth college nationwide and the second in Vermont to commit to divestment as part of a nationwide campaign that has spread to over 300 colleges and universities and more than 100 cities and states across the country. The GMC Board of Trustees voted on Friday, May 10 to immediately divest from fossil fuels and establish a process for aligning future investments with social, environmental and governance goals. GMC has a $3.1 million endowment, only 1 percent of which is currently invested in the 200 fossil fuel companies that own the vast majority of the world’s coal, oil and gas reserves. So it’s a symbolic victory, yes, but one that demonstrates the increasing traction of the divestment movement. Students at GMC began their divestment campaign last February. In March, a number of students participated in Mountain Justice Spring Break, traveling to West Virginia to witness the devastation of mountaintop removal firsthand. In April, the GMC Student Senate voted unanimously to support divestment and more than 50 percent of the student body signed on to a petition supporting the move. Attention College Students: Get six months of The Nation’s digital edition absolutely free! Activists are also pushing for divestment at the state and city level. Mor than 957 people have signed a petition, to date, calling on the state legislature to pass legislation to divest the state’s pension funds from fossil fuels. Over the coming weeks, students across the country will continue to meet with their boards of trustees to push for divestment. This summer, the Go Fossil Free campaign aims to expand the divestment movement and lay the groundwork for an even bigger fall of organizing on campus. Read Emily Crockett on why the millennial generation isn’t just a bunch of narcissists, as a recent Time article suggests.